Technology seems to be progressing at an alarming rate, and in some cases this can be a little terrifying. I mean having a robot overlord ruling the earth doesn’t seem to be a good time. In other cases, like with at-home anti-aging devices, it can be kind of exciting. The problem is with so many of these so-called “revolutionary” devices on the market how do you know which ones are really worth the investment? We’ve tried our fair share of at-home anti-aging devices and as such have had many disappointments. Trophy Skin’s MicrodermMD was definitely a surprise in the best way and continues to be so. If you aren’t familiar with this anti-aging treatment, microdermabrasion helps to exfoliate the skin’s surface to reveal the fresh layers underneath and also tackle concerns like hyperpigmentation, a dull complexion as well as fine lines. The MicrodermMD uses a diamond tip, the more popular type of the anti-aging treatment which is as effective without any messy cleanup like the alternative crystal microdermabrasion. Professional Microdermabrasion treatments can be cost ($100/treatment+) and time consuming (especially when you count in the travel-time). The MicrodermMD offers advanced results without the costs or the time commitments of going to a professional’s office. 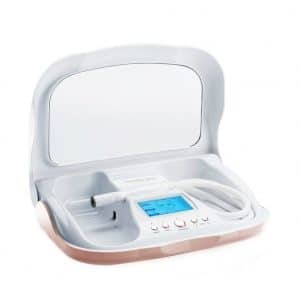 When we first started with the at-home diamond microdermabrasion device we were a little hesitant but the LED display has an auto-mode feature with a visual guide making treatment easy for any type of beginner even for a Luddite like us. Those who require more advanced care shouldn’t fret as the device has 8 different setting to suit all types of skin needs. Finally, we love how the anti-aging device comes with a 3-year warranty and also a 60-day money back guarantee. Make sure to check out our guide if you’re looking to learn more about diamond microdermabrasion treatment inclusive of how it works and more in-depth information on results.